As you may have read, at my 32 week scan we discovered that much like M, this baby was breech. I was duly booked in for a caesarean section, ‘just in case’ the baby didn’t turn. To be honest, while I was (and still am) hoping for a VBAC (vaginal birth after caesarean), I thought it was pretty sensible to get the C-section booked in. After all, M didn’t turn, so there’s not really any reason why this baby would, either! However, I didn’t want to give up hope entirely, so I started looking around online for ways to provide this baby with the best chance of turning head-down. 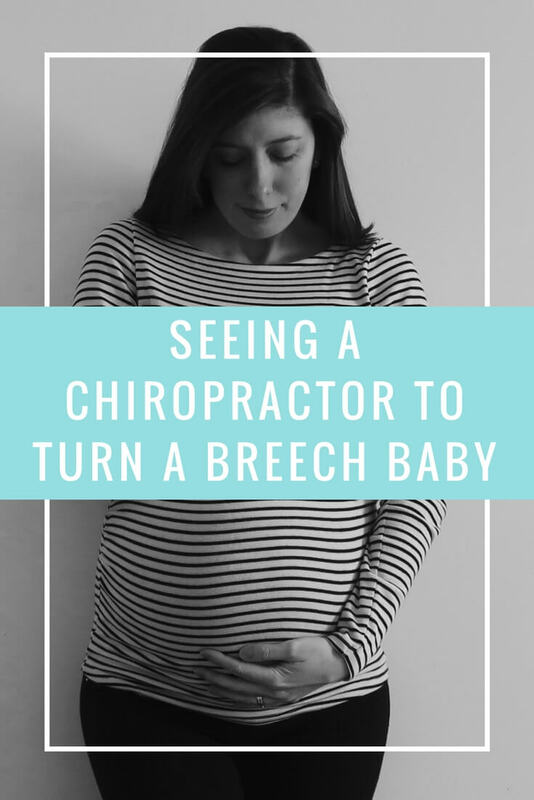 One of the ideas I came across was seeing a chiropractor to turn a breech baby. I read on the Spinning Babies website that a baby may be hindered from turning head-down if the mother has asymmetry or a twist in the pelvis. Given that I had been experiencing sciatica down one side of my back/bottom/leg, I thought that this may be a possibility in my situation. Therefore, I thought seeing a chiropractor to straighten me out might be worth a try. My theory was that even if the baby doesn’t turn, at least something might be done to help my sciatica so that I can move a bit more freely and enjoy being pain-free, as it was getting to be a daily occurrence and causing me quite a bit of discomfort. As I write this, I am yet to discover whether the baby is in fact still breech or has turned. Unfortunately, I think I left it a bit late to see a chiropractor. By the time I was able to get an appointment, I was already more than 34 weeks pregnant. At my first appointment, the chiropractor identified a twist and flex in my pelvis, and adjusted my body accordingly. This made me feel better as at least my theory for seeing the chiropractor in the first place seemed sound! Sadly, from the movements that I’ve been experiencing, I’m pretty sure that this baby is still breech. However, seeing the chiropractor has done absolute wonders for my sciatica! As I write this, I have only had two appointments; one was the initial consultation which was mostly talking and the short adjustment I mentioned above. My second appointment involved further adjustments alongside a deep tissue massage. And boy, was it deep! This was definitely not akin to your usual relaxing massage; I felt really bruised the next day. However, even since the first appointment I’ve barely experienced any pain in my back at all, so it was 100% worth seeing the chiropractor just for that! I’ll find out at my next scan whether seeing a chiropractor to turn a breech baby has been a success. I’ll keep you posted! "10 Values to Instil in Your Child"